I come from a loving and supportive family. I have always been close to my mom, Liz. She has a degree in early childhood education, and she gave her full attention to raising my sister Kate and me. Our home was filled with activity. She taught us songs, played games with us, and took us to swim team and play dates. My mom has a special relationship with our friends as well. (She gave my friends nicknames that have stuck with them to this day!) While I was away at college we should speak almost daily, and I could expect to receive a care package or card every week. “Just because!” she would write. By the time I graduated in the spring of 2009, those calls had become less frequent. It was clear that something wasn’t quite right. My mom was starting to forget important dates and repeat herself. In the fall of 2010, just before her 57th birthday, she was diagnosed with dementia. No matter how much you are expecting a diagnosis like that, absolutely nothing can ever prepare you for it. Up until two months ago, not that many people in my life knew that my mom has dementia. Because of that, I struggled with my decision to participate in The Longest Day, an Alzheimer’s Association event to raise awareness and funds for programs, support and research. I was scared that I would get asked questions that I wasn’t prepared to deal with, and more than anything I was scared about how “real” this would make everything. With the support of my family and my boyfriend, I signed up with the objective of raising the $1,600 team goal by myself. I had no idea how many people would rally around me. As of today, the day before The Longest Day, my team, the Cape Cod Alzstars, has raised more than $33,000 for the fight to end Alzheimer’s. I am so thankful to know such generous and thoughtful people! Tomorrow, on the longest day of the year, we will be waking up bright and early to tackle the Cape Cod Bike Trail. We are also putting on The Longest Day Fishing Tournament, which will be followed by an amazing BBQ and a night surrounded by friends, family and even people we will be meeting for the first time—all of us bonded by a connection to Alzheimer’s. More than anything, I want my mom’s dementia to go away. I can only hope that the money raised by everyone who participates in The Longest Day will help us get closer to a cure and will prevent other families from having to go through this. It’s been three years since I first heard the diagnosis, and I am still trying to wrap my head around the challenges that face my mom, and my dad as her primary caregiver. While making the decision to participate in this event was not easy for me, I am so incredibly glad that I did. Knowing that we are not alone—that others are standing with us—helps as we try to adapt to a new life and an uncertain future. Tomorrow is about you, Mom. I’m in it until Alzheimer’s is finished. 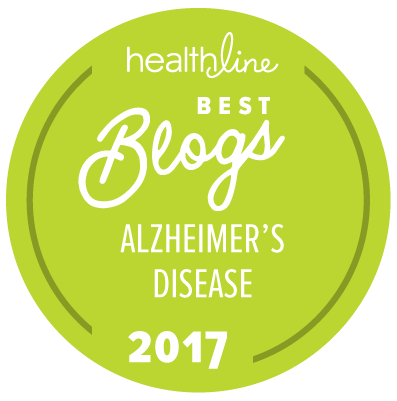 About the blog author: Molly Waugh is participating in Alzheimer’s Association The Longest Day®, a sunrise-to-sunset event on June 21, 2013, to raise awareness and funds for Alzheimer’s care, support and research. Click here to follow Molly and her team, “Cape Cod Alzstars,” during this 16-hour event. I fully understand where you are at Molly. My Mom, showed similar "different" behaviors for her, while I was in college around 1999…it wasn't until 2005 that she was diagnosed with early onset of Alzheimers, at the age of 58…she definitely had lived with it for years before that without proper diagnosis. She just passed away at 65 last month, after a very long, heart wrenching struggle with the disease. Try to hold on to the good days with her now, and the good memories of your childhood. There is a sweet sense of peace knowing my Mom is no longer struggling in silence, knowing she is with my Grandparents and other loved ones now, and no longer lost in her own mind. All the best to you and your family, and I'm so happy for you that you were able to raise so much on your Mom's behalf! This is beautiful and amazing. Thank you!!! My father has Alzheimer’s and Parkinson’s disease an he too was diagnosed at an early age. What a beautiful tribute. I'm a daughter myself and you have captured the shock and pain that never seems to go away. However, your words are inspirational and I hope to be a part of something like this next year. I need to feel less alone in this fight, and you have helped me to feel this way. Please know your not alone, like i said in my comment, i was my mom's 1 and only caregiver. I really never visited any sites or asked for help in all the 10 years and she passed 11 days ago. It is very comforting to see and read all this.I should have used the resource's out there and visited maybe some support groups, because right now seeing your comment reminded me of myself.I feel sooo much better in my mind and heart knowing wasn't alone. and i want you to know this , so you don't feel like i did. 10 years to late. You are NOT alone. I'm 27 and my father was diagnosed 6 years ago. It hasn't been easy, but it has made my family stronger than I ever imagined. The support of others was critical in the beginning. Alzheimer's is a terrible disease, but I am grateful that it helped me understand the brevity of life. Molly, you are an amazing daughter!! My mom was diagnosed with Alzheimers in 2011 at the age of 78. My dad passed away in 2004. I can't tell you helpful it is to hear the stories of other families that are going through the same thing. My brother and I are struggling to make the right decisions for our mom, and to do what we feel is best for her, when we have no background of information to pull from. My mom is really having a hard time with "Sundowners", and we're at a loss as to what needs to be done. I know that there are a lot of diseases that deserve attention and support. Cancer and Heart Disease being prevalent in my own family, but I don't think people hear enough about Alzheimers to know what a devastating disease it is, so I appreciate your efforts in raising money for that cause. God bless all. Your comment caught my eye because we have the same first name except mine has an e on the end and my mother has Alzheimer's. She is 85 years old and is the end stage. My dad passed away in 2008. Please check out the Facebook page Memory People. There is so much there I know you will love it. Contact your mother's primary care physician. There are medications that can be prescribed to help alleviate your mother's "sundowners" issue. Hope that helps. I agree. I don't think people hear enough about Alzheimer's. That is why people like Molly are so important in this fight. To raise money and awareness. Thank you!!! Thanks for sharing Molly, especially for being brave enough to get involved and raise all that money I only hope it helps others to realize we all have to stand together and do what we can to help cure this horrific disease. My father was diagnosed at age 59 and he is now 71 and is in stage 6 if not the final stage. Tomorrow for the longest day we will attend a Cleveland Indians baseball game where the proceeds will go to the Alzheimers Association to honor those affected. You are not alone in this fight…stay strong and best wishes. Molly you are an incrwdible daughter..your love shines bright! Molly, You are an incredible daughter and you spirit shines bright. For great information, love and support please check out the Facebook page Memory People. It's a closed group but you can become a member. It's for family, caregiver, patients anyone struggling with this horrible disease. It was started by Rick Phelps who suffers from early onset Alzheimer's. My mom had Alzheimer's 8 years before her passsing. There is so much the family and the caregivers need to know about this condition. I was fortunate enough to take some very informative classes for family and caregivers. What hurts the most is when they don't know who you are, anymore. My prayers are with all of you. God bless you and your loved ones. Bless you and hold the happy memories, make more and if you can have mom tell stories and tape.I missed my mom for 3 years before she left, because she stopped talking but she still sang. Thanks Molly for stepping up to the plate and taking command of this battle against this terrible disease .You and your supporters have advanced one step closer to winning the war .It's not easy to put your personal life out there for all to see, but by doing so ,you have rallied great people to the cause.Keep fighting the good fight, and God speed . Lovely to read. My Dad is 88 and was diagnosed about 6 years ago. There are few words to describe what he is going through because I cannot see, feel or empathize with him. Such a painful and sad disease to watch, especially when the ALZ. person is aware of the diagnosis. I cannot imagine what those moments in the "black hole" must feel like. This disease is a steamroller and I do not think we are doing enough…and I do not think society realizes the seriousness of the future implications this will have to all of us. Lets break down these obstacles to cause, treatment and cure. Molly – thank you for sharing your wonderful story, and for your courage!! Congratulations to team Cape Cod! My Dad had Alzhiemers and Dementia..he suffered Sundowners too…He suffered for over 2 years then he started failing fast about 1 year ago.. he was bedridden toward the end…we weren’t aware that his Cancer had come back for the 3rd time…my Mom took very good care of him.. there was Hospice..but they can’t be there all the time. He lost his battle December 29, 2013. This is an awful desease. .I wish there was a cure cause it takes the strongest wonderful people and destroys families and it needs to be stopped! I would love to have joined the cause..my thoughts are with everyone that participates..and thank you! ;)God bless us all. My Father was diagnosed with Alzheimer's when he was 60 yrs old, although his forgetfulness and repeating himself had started several years before that. The Drs. called it "early onset" Alz, which was even worse for my mom and I to hear because we saw that most people didn't receive a diagnosis like this until much later in life. So Mom (and I) took care of him for 101/2 years, watched him go downhill and Mom became very sickly herself. I am an only child, have 3 kids of my own and had no way to care for my Dad in my home. We were forced to place him in an Alz facility where he lived for 2 years until he became too much for them and we had to move him into a fully skilled nursing home where he lived one year and died. I can't and won't give all the details about the facilities he lived in and the curcumstances of his death. Let's just say that after exhaustive researsh and finally chosing what we thought was the very best for him, the places he lived in were no better than the care he could have gotten in a state home with workers who are barely paid minimum wage to do one of the most important jobs in the world. The employees didn't "honestly" seem to care…they just punched their time card, went through the motions and weren't really concerned if my Dad was comfortable, dry, fed, and clean or not. Some days, I would pop into the place unannounced and they would all jump up from watching TV and scramble to make it look like they were doing things for him. But I would find him wet, soiled, dirty face and hands from having gotten messy during a meal. Eventually he could no longer feed himself and they weren't very patient with having to siit and feed him. I started to go in and feed him myself. Alz disease is a total loss of dignity and it is heartbreaking for any family/loved ones who watch their loved one go through this. I try to remain hopeful that somehow a cure will be found, but there are days when I'm not sure it will happen. 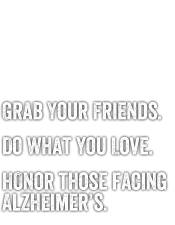 Best of luck to those honoring people who are still fighting the Alz battle. This is such an important issue and it never gets the attention it deserves. My mom passed 6-10-13, just 11 days ago. I was her 1 and only caregiver until i called hospice on 6-2-13. We struggled with this terrible and heart wrenching diease for over 10 years.Growing up and her raising 3 children on her own, for everything she went through before the diagnosis, she was the strongest , most good hearted, beautiful woman in the world and watch each and everyday her decline was soooo heart wrenching. i would like no family to ever go through and watch that. Molly i commend you and all your beautiful efforts. Most of all stay strong with love and patience. Hopefully they find some sort of cure for this terrible diasese and my heart goes out to all those and families suffering with it. I will be celebrating today and everyday . YOU GO MOLLY! GOOD LUCK to you & your team-GOD BLESS YOU ALL! Thank you for this wonderful blog. My story is similar to yours, and our moms have similar backgrounds. My father is also the primary caregiver. I would love for you to email me, and we can lend support to each other. Well written Molly! You are an incredible daughter! Lizzie thanks you! Thinking of you today!